Half-mile dusty dirt road to the campground. Sites and roads all gravel throughout Park. Sites fairly level but closer together than we'd prefer. Great views of the hills only if you're lucky enough to get a site on the perimeter of the campground. Wi-fi, Verizon, and broadcast TV all very weak. Could only pick up 4 TV channels of old comedy reruns. An hour away from any major town. It's a place to sleep if you're in the area to see Little Bighorn National Battlefield. Other than that, not much reason to be here. We camped at 7th Ranch RV Camp in a Motorhome. Little Bighorn Battlefield National Monument was worth seeing. Be sure to stay for the Ranger talk. Also enjoyed Bighorn Canyon NRA. Once again I am confused by ratings. This is an ok place to spend the night. It's your usual average RV overnight stop. Certainly a good nightly rate but not worth the drive 30 minutes north of Spokane. It was difficult finding a way through Spokane - no direct route for trucks/RVs - just city streets. I really wish that we had just stayed along I-90. This park is your basic fairly close together sites. Small bathrooms- only 2 per gender. Sites are gravel and fairly level. Our concrete patio had a large electrical box. Only 2 rows have grass and landscaping between sites. The rest were literally on top of one another - a gravel parking lot. Lots of permanents. Staff was friendly and helpful. Yes they do have a vegetable garden but no other amenities. No cable tv. We did get OTA channels. Did not use WiFi. Good Verizon reception. Nothing nearby except an Exxon station. We camped at Wild Rose RV Park in a Motorhome. As a place to park for the night it was ok. Clean bathrooms and full hookups but basically a gravel parking lot with very close spaces. Extremely windy! 20 mph+ We didn't even put the slide out. Not a place to stay. Just an overnight stop. We camped at Sherman County RV Park in a Motorhome. Next to a fairgrounds in a very small town. Not much to do. The park was overpriced for such poor sites. The $56 rate was the normal Good Sam rate but in the Harvest weekend the price was $89! They wanted to charge $8 more as they raise the rates when there is competition for the few remaining sites! We were going to leave but they found a way to give us an additional discount (first visit) so the rate remained $89. The sites were pull-in which means that there are 2 RVs per driveway. You are right next to the person in front of you! The park does have a nice pool area and a wine tasting during the Harvest fest. Due to the high rates for such close sites, we would not stay here again. We camped at Wine Country RV Resort in a Motorhome. Very hot park! No shade and our RV was facing east so the side where we sit outside was totally in the afternoon sun. Sites very close together. No cable or broadcast TV reception. Our Verizon phones did work and we used our cellular service for streaming. Other reviews mentioned the "view." Yes you can see the hills in the Angeles Forest but you can also see the freeway! I have had way better views in other parks! As mentioned by others, park entrance is on a hill. We parked on the street to disconnect our tow vehicle. No picnic table or patio area. We camped at The Californian RV Resort in a Motorhome. Nice area for a short stay to visit nearby national park sites. Flat and level but sites close together when full. Not much around as the park is in an agricultural area. 20 minute drive to west side of Bakersfield for good restaurants and grocery stores. Down side - all the noise from the freeway and trains. Was able to sleep but still very noisy. We camped at Orange Grove RV Park in a Motorhome. Yanks is a fairly new RV resort. Everything was in pristine condition. Very nice landscaping between sites. Concrete pad. One of the best RV parks that I have stayed. Staff was very pleasant and helpful in recommending outings. Only downside: not much in the way of restaurants or grocery stores in the area. It is close to the west entrance (11 miles) of Pinnacles National Park which was our destination. Views of the mountains and beautiful sunrises. Monterey, Carmel-by-the-Sea and Big Sur coast were all about an hour away. We enjoyed our stay here and would come again. We camped at Yanks RV Resort in a Motorhome. Extremely close together. Very noisy! Park sits right on Hwy 97. We had Site 1 so we were facing the highway. No room to park our car (and we have a 32 ft Class C!) Fortunately there was room at the front of their parking lot for extra vehicles. Friendly staff and wifi worked. Cable TV. Just very crowded sites. I would not stay here again. Sadly, there wasn't much available in the area when we visited. We were here to visit family. We camped at Newberry RV Park in a Motorhome. This park is a disgrace to the National Park Service. Sadly, it is not even run by the park service but by The Grand Teton Lodge Co., a concessionaire. 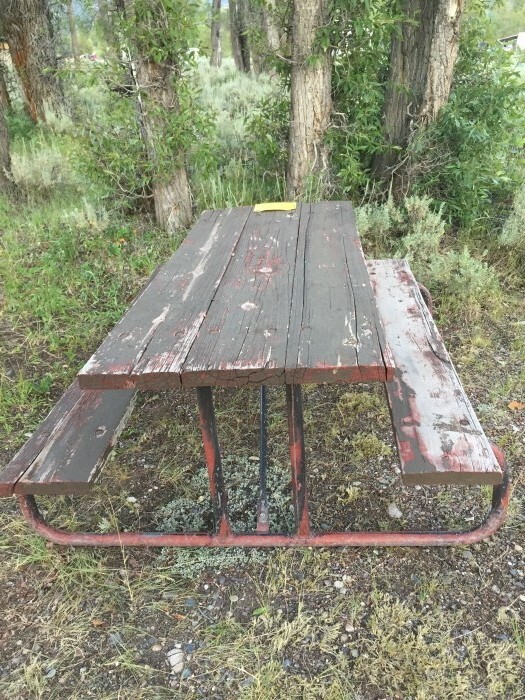 The campground is in need of major maintenance. The roads are falling apart and the sites are in very poor condition. 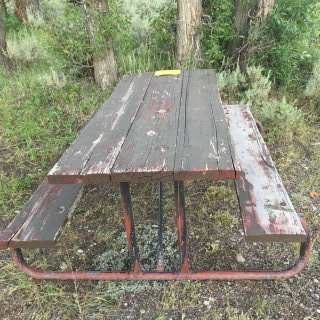 Our picnic table was sagging and the paint peeling off. Further, employees are extremely rude. I paid for my site. The 2 employees in the office had a discussion about which site to give me. Finally they suggested 3 sites and told me to go look at them. While I was gone, they sold 2 of the 3 sites that they had recommended! I could not have the site that I had chosen even though I was there first and I had paid! I was rudely told that you wanted to go look. We told you to choose 3 sites as we might sell one while you're gone. I didn't choose to go look - they suggested it! When I said that this didn't seem right as I had paid, I was very rudely told "You want your money back? You can leave!" We did eventually find a site with a few trees. Most sites sit out in the hot sun with no shade. I have visited almost 300 NPS sites, have camped in many and have worked in a national park. This is by far the ugliest (and expensive) NPS campground in which I have ever stayed! NPS needs to go back to managing their parks and fire these awful concessionaires! We camped at Gros Ventre Campground (Concessionaire Operated) in a Motorhome. I don't understand on what others are basing their review. This place is nothing more than a parking lot! Yes it's fairly level but so is a Walmart parking lot! Falling apart, dirty motorhome parked next to us. No TV reception as noted in other reviews. $26 for a parking space, electric and water and no sewer. Outrageous! I paid less at a state park with full hookups and a nice view. Glad we pulled in at 7 pm and are just here for the night! We camped at Blowing Springs Campground in a Motorhome. While there is a nice view around the campground, I have to totally disagree with others who state the sites are large. They are not - at least not in the row where they put the short stays. We were right on top of the two trailers on either side of us. When putting out their awning, the woman next door to us was standing right next to my window. There was barely 3 ft between the trailers. I constantly heard this couple speaking. Bathrooms were clean but much in need of rehab. One shower and one toilet in the very small bathroom. Wifi worked intermittently. I was constantly being dropped. I finally gave up and just used my cell service. We camped at Lake Champagne Campground in a Travel Trailer. After reading the reviews about this park "being the best in AZ", we were thoroughly disappointed. The sites for RVs are nothing more than a gravel parking lot with hookups. There was a concrete pad with a picnic table, but the rest was gravel. No landscaping. The vehicles accompanying the RVs on the lots next door were parked right next to my RV. Not a pretty view. And the Wi-Fi absolutely does not work! If you have an Apple iPad, you have to go the office and they enter some sort of authorization. (This is not written anywhere. Just find out after complaining to the office when the Wi-Fi would not work!) Even with the authorization, we could never get on with our iPad. My laptop could not log on either or would constantly be bumped off. I rented a router ($120 deposit) from the office. Again, the offer was only made after I complained. The router helped somewhat, but mostly the Wi-Fi did not work. We were also parked across from the dumpster which was constantly full. With the windy conditions, trash and recyclables were blowing onto our site. Maintenance never came to clean up the trash. Bathrooms were nice, but there was only one wash house for the RVs. Showers were always full! Same for laundry room. The park is located on the flyway for both the Tucson International Airport and the nearby military base. Extremely noisy! I would not stay here again or recommend it! We camped at Rincon Country West RV Resort (55+ park) in a Travel Trailer. We chose this park as the mineral pools sounded nice and they were! Staff was also very friendly. The downside was that there was no Wi-Fi unless you set up your own account with a separate company for $30 a month. As the previous reviewer stated the park model homes were very rundown and in some cases deserted. The surrounding neighborhood was also not very nice. It was a 30 minute drive to Palm Springs or Palm Desert. The bathhouse while clean was "cold." It was a bare concrete floor - a type of bathhouse one might find in a state park, but not in a private campground. The sites were also close together. We could hear the dogs barking in the Motorhome next to us. Rate was based on the monthly rate. I would probably not stay here again. We camped at Sam's Family Spa in a Travel Trailer. Staff was very friendly. As it was Oct., the pool was not open, but the hot tub was. Although the hot tub closed when the office closed, we did enjoy using the hot tub. The water could have been warmer, but it was still relaxing. Bathrooms were very clean. Nice laundry facilities. We were in the section of the park with grass and trees. We were in the back of the park and had a nice view. Close to Albuquerque. We enjoyed our stay here and would return. Rate was based on a monthly rate. We camped at American RV Resort in a Travel Trailer.